Mount Everest:-to the Nepalese it is simply called Sagarmatha, the "sky head". To the Tibetans it is Chomolungma, the mother goddess of the earth. To the rest of the world it is the most renowned mountain of all. When it comes to spectacular breathtaking mountain panoramas, the Everest Trek is without equal. The walk to Everest Base Camp from Lukla takes you through lush valleys with abundant flora and fauna, past friendly Sherpa villages and Buddhist monastaries, and far above the treeline towards the earth's highest mountains. Ama Dablam, Lhotse, Nuptse and Mt. Everest tower above you on this challenging but very rewarding trek. Arrive in Kathmandu and transfer to Hotel. There will be a short arrival briefing to get you oriented and to take care of the necessary bureaucracy for the trek. 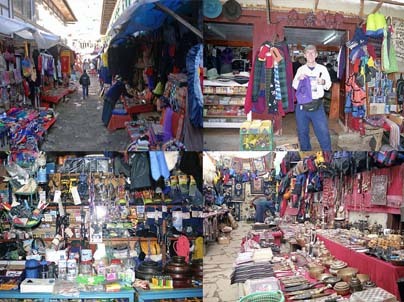 After breakfast full day sightseeing tour of Kathmandu and Patan by private car with English speaking guide. After breakfast free. After lunch followed by a major trek briefing. We can also assist you with the purchase or rental of trekking and/or climbing equipment if required. After breakfast transfer to airport for flight to Lukla from Kathmandu , perched at 9350ft (2850m) in the Khumbu region of eastern Nepal. The flight is bound to be one of the most exhilarating you will ever take. Much of it is only a few hundred feet above the ground, and the views of the river valleys and terraced landscapes below as well as the proximity of some of the world's highest mountains make it a truly memorable experience. The porters' loads are organized in Lukla before we head north up the valley of the Dudh Kosi ("Milk River") to our camp above the river at Phakding (8661ft, 2640m). (3 – 3.5 hours walking). After breakfast enter the Sagarmatha National Park before beginning the long, steep climb up to the town of Namche Bazaar (11319ft, 3450m), the main administrative and trading centre for the Khumbu region. Magnificent forests of blue pine, fir, juniper and rhododendron as well as our first views of Everest help ease the climb. Our camp will be at the upper end of Namche to afford the best views (4 – 5 hours walking). Full day in Namche. 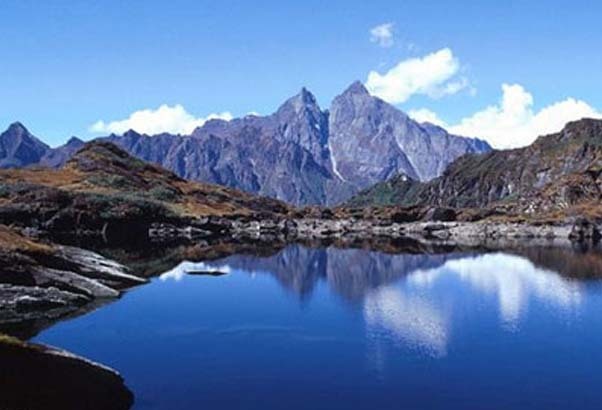 Although this day can be spent relaxing in camp or exploring the tiny shops in the bazaar, the best option for altitude acclimatization is a hike up the valley of the Bhote Kosi ("River from Tibet") to the west. This is a wonderful pastoral walk, and those who are very keen and well-acclimatized can continue to the village of Thame and its monastery. Camp in Namche Bazaar (3.5 – 5 hours walking). After breakfast visit to the colourful Saturday market, where local and Chinese goods (brought over the high passes from Tibet) can be seen and purchased. A short, stiff climb brings us to the small airstrip at Shyangboche before we detour to visit the Everest View Hotel with its spectacular views of the Khumbu Himal including Everest and Ama Dablam. We then descend briefly to our camp in the village of Khumjung (12434ft, 3790m). The afternoon is free to. visit Khumjung Monastery with its famous "yeti scalp" and the Hillary School (1.5 – 2 hours walking). After breakfast staying high above the main trail, we contour and climb to the Mong La with terrific views of Ama Dablam. Camp is in the very traditional Sherpa village of Phortse (12467ft, 3800m) where we may well see Himalayan tahr (mountain goats), danphe (impeyan pheasants) and musk deer. (3 – 3.5 hours walking). After breakfast there are stunning views of Tengboche and Ama Dablam during this morning's ridge contour/climb up the Imja Khola Valley to the village of Upper Pangboche with its ancient monastery. We continue up the glacial valley after lunch, passing some of the Khumbu's most beautifully carved mani (prayer) stones. Camp is at Dingboche (14271ft, 4350m) at the mouth of the Chukhung Valley. (4.5 – 5 hours walking). After breakfast this is the second of our important acclimatisation days. It can be spent relaxing in Dingboche enjoying the scenic views of Ama Dablam, but the best option is a morning hike up the valley to the lodges at Chukhung. This route passes below the massive Nuptse-Lhotse wall and offers marvelous views of the surrounding mountains. Afternoon free in Dingboche. (3 – 3.5 hours walking). After breakfast hike is relatively short as we continue our acclimatisation process. The trail climbs gradually to our camp in the tiny settlement of Dughla (15092ft, 4600m) nestling below the terminal moraine of the Khumbu Glacier (1.5 – 2 hours walking). 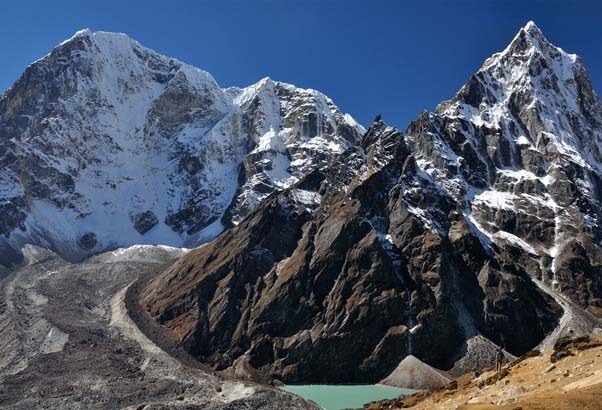 There will be an optional side trip to a spectacular viewpoint that overlooks Tshola Tsho glacial lake below Cholatse and Taboche peaks to the south, and also offers an incredible view of the peaks at the head of the Khumbu Valley. After breakfast It's a short but steep climb to the lodges at Lobuche (16207ft, 4940m). We have a wild campsite north of Lobuche tonight with particularly impressive views of the sunset on Nuptse. (1.5 – 2 hours walking). After breakfast this is a demanding yet very rewarding day. We follow the ablation valley and then negotiate several glacial moraines to reach the lodges at Gorak Shep (16962ft, 5170m). Our goal today is the ascent of Kala Pattar ("Black Rock"), a small peak by Himalayan standards at 18200ft, 5545m. The climb is hard work, but offers the most magnificent mountain panorama possible: Everest (the highest point on the planet at 29028ft, 8848m) towers directly ahead, while Nuptse, Lhotse, Changtse, Pumori and countless other giants loom on all sides. The descent to our camp at Gorak Shep is much easier. (4 – 4.5 hours walking). After breakfast another tough day with great rewards, as we trek along the Khumbu Glacier to Everest Base Camp (17600ft, 5380m). This is the closest that you can get to Everest without mountaineering equipment, and there are often several expeditions in Base Camp. The view of the Khumbu Icefall from here is spectacular. It's then a long descent to the comparatively thick air of our camp in Dughla. (6 – 6.5 hours walking). NOTE: Those doing Island Peak climb will proceed from Lobuche to Dingboche on this day). After breakfast from Dughla, we take a slightly different route down to Lower Pangboche before crossing over the Imja Khola and climbing through lush pine and rhododendron forests to our camp at Tengboche (12664ft, 3860m). 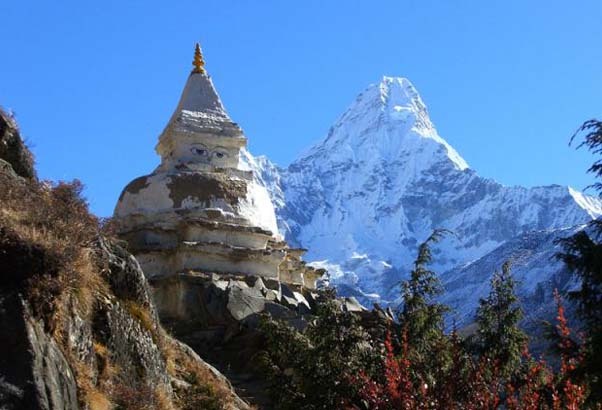 This is the site of the Khumbu's most important Buddhist monastery, and we will have the opportunity to explore the monastery and to observe the monks at prayer and at work. (4 – 4.5 hours walking). After a spectacular sunrise, we descend steeply to the Dudh Kosi before climbing to join a ridge contour trail offering farewell views of Everest, Nuptse, Lhotse, Ama Dablam and other Himalayan giants en route to Namche Bazaar. Another descent brings us back to the Dudh Kosi and our camp in Chumoa (9235ft, 2815m) just outside the National Park. (4.5 – 5 hours walking). After breakfast an easy day's walk brings us back to Lukla for our final night in the Khumbu. Although it may have looked primitive the first time through, Lukla will seem quite modern compared to the isolated villages further up the valley (4 – 4.5 hours walking). After early breakfast transfer to airport for flight back to Kathmandu from Lukla, and gives us a last view of the mountains, arriving in Kathmandu and transfer to hotel. 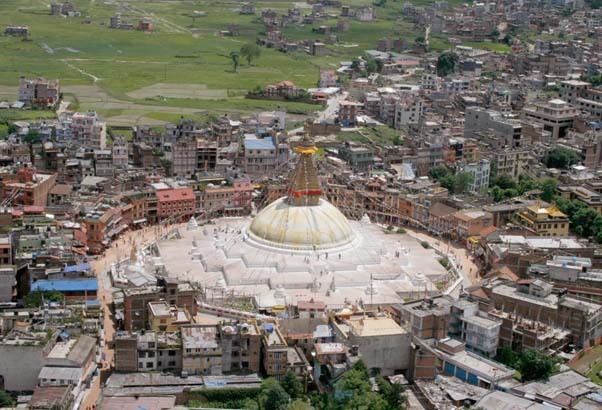 Free in Kathmandu to continue exploring the valley and surrounding hill towns. We can organise an optional flight over Mount Everest or an optional biking trip around the Kathmandu Valley. End of the Everest Base Camp program. Transfer to the airport for your return flight, or start optional trips in India and Tibet.